This is Lungwort, or Lungenkraut in German. (Is that Lung Cabbage? You know, Sauerkraut – Pickled Cabbage). 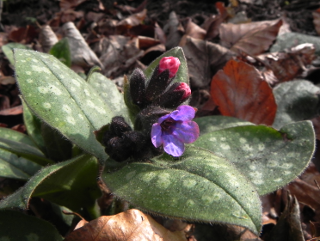 Even the Latin name is Pulmonaria, pulmo being Latin for lung. Back to Sauerkraut for a moment. The cabbage is shredded and layered with salt and left to ferment. It ferments because the ‘good bacteria’ are present on the cabbages anyway. The idea of fermenting cabbage came from China, probably brought to Europe (or at least Asia Minor) by the hordes of Genghis Kahn. Having despoiled China, they rode off to repeat their performance in the west, carrying jars of pickled cabbage in their saddlebags. It’s no wonder they have such a bad press, is it? The fermentation process makes the environment in the cabbage jars too acid for botulism to feel comfortable, so if you keep the lid on it will last several months without going bad. This seems to be another one of those foods that have vitamin C in so it must be good for you and is now considered a delicacy. In reality, people, even the Chinese I’m guessing, because it was still edible after a few months storage, only ever ate the stuff when there was nothing else to eat. In the Middle Ages, I’ll bet they were even pleased to see Spring Greens on the supermarket shelves after a couple of months on a diet of sauerkraut – vitamin C or not.